The firm was started by Derek Wright in 1957 (making 2007 our golden anniversary). Using a converted cow shed, loft area, yard and later acquiring 2 fisherman's cottages he created a thriving carpentry and joinery business. The cow shed was converted into a joinery shop with all the necessary machines for making windows frames and the like. The cottage being used as a store. In 1971 the loft was demolished and in its place a modern shop was built. This shop enabled the business to take a new direction: DIY and Art & Craft. In 1970 his son Gary joined the business. This heralded a shift into art and picture framing and less emphasis was placed on the DIY side. The old cottage was converted into a picture framing workshop; complete with necessary machines. Gradually the door handles and hinges made way for brushes and pencils, the household paints for oil and acrylic and picture frame mouldings replaced timber. Over the years paintings were hung in the shop on behalf of the artist. From this grew the desire to open their own gallery. Eventually, in 1997, the last remnants of the DIY stock were disposed of and a brand new gallery opened in this area of the shop. The business was also now much more Art and less Craft. In 1998 Gary's daughter Marie joined the family firm, three generations of Wrights serving the art community. She set about creating a gallery to show works of art which has grown more in recent years. Also a variety of antique bits & bobs have crept in under her supervision, you really don't know what you will find in our nooks 'n' crannies or on our whatnots! Having worked in the business since its humble beginnings, Derek finally decided to take it easy and retire, doing so in 2003. He is still likely to be found in the workshop, working on some project or other. The business is now firmly rooted in all things art. A budding artist can obtain all the things needed to pursue his or her chosen field. From pencil drawings, through pen and ink, acrylic and water colour to oil painting Wrights stock everything. They have all kinds of paper, board and canvas, the right brush for the job and can, of course, frame the final product. They even sell the books to tell you how to do it. For those of you who don't paint or draw in the conventional sense there is a wide range of alternative craft items. There is something for everyone. After 30 years the Wright family have built up a substantial reputation for professional picture framing. They serve not only the needs of the amateur and professional artist, but also museums, government and commercial organisations. No job is to too big or too small. 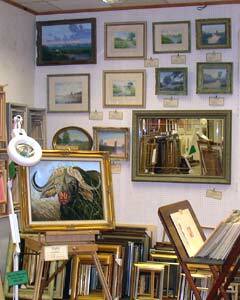 Having a large workshop they are able to make bespoke frames up to 8' by 4', and larger if required. Add to that the expertise to mount both pictures, tapestries and most anything you could want in a frame, you have a full service.